Powers/Abilities: Through her mystic conch shell, Dragonrider can control large sea beasts (at least one of which was a mutated eel) to do her bidding. She can ride these beasts and they respond to her will, her mind in effect becoming their minds. She can control at least three beasts at the same time. At least one beast had hypnotic abilities. The extent of Dragonrider's powers is unexplored. History: (Sub-Mariner II#2 (fb)) - The woman who would later become Dragonrider served for years as an imperial guard in the Atlantean military. She was assigned to the outer borders of the realm, where she watched poverty take effect while the capital city thrived. After these issues continued for years, she became more and more bitter towards Atlantis and she and others formed a rebellion. (Sub-Mariner II#4 (fb)) - Dragonrider and other rebel leaders made contact with Jacqueline Trufaut, a surface woman who had discovered mystic artifacts that would empower their users. 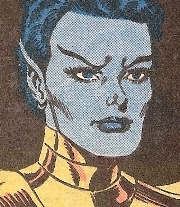 Trufaut sought revenge on Namor, and offered to empower the rebel leaders in their cause. She gave Dragonrider a mystic conch shell that would allow her to control great sea beasts. Trufaut then mutated at least one eel into a sea dragon that Dragonrider could ride and control. Dragonrider's powers were patterned after Triton, the son of Neptune, who 'rode on the back of a sea monster, trumpeting a conch.' Trufaut empowered three other rebel leaders into Proteus and the Mad Twins. (Sub-Mariner II#1 (fb)) - When Trufaut contacted Dragonrider, Dragonrider led her dragon in an assault on Atlantis. After destroying a portion of the city with little existence, Dragonrider turned away from the city and swam away. (Sub-Mariner II#1) - While swimming away, Dragonrider ran into Namor, who was returning to the city unaware that it had been attacked. Dragonrider had her dragon swipe Namor with its claws and tail, and then attempted to hypnotize Namor into defeat unsuccessfully. 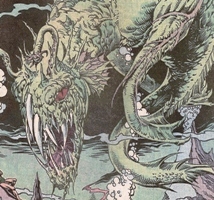 After Namor impaled the creature with two of its own teeth, the dragon caught Namor in its antennae until Namor dismounted Dragonrider with a small whirlpool. Namor continued battling the creature (who was still under Dragonrider's control) until he fooled the creature into shoving its head into an active undersea volcano, defeating it. 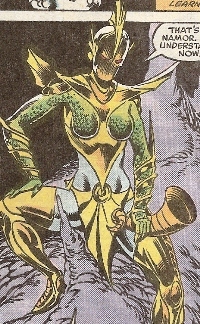 Namor unmasked Dragonrider and forced her back to Atlantis, where she gloated over the shock on his face to see Atlantis devastated. (Sub-Mariner II#2) - When Namor confronted Dragonrider about her actions, she calmly explained the situation on the outer borders of the realm and Namor threw her aside violently, calling her a liar. He sent her away to the dungeons rather than question her further. Meanwhile, Proteus laid plans that led Namor into a trap back in the rebel base, Amphitrite. (Sub-Mariner II#4) - Dragonrider (on one of her dragons) gathered at Pontus with Trufaut, the Mad Twins, and Proteus (in the form of Namor) for final battle with Namor. When Namor arrived, thinking Trufaut kidnapped, Namor battled the villains and was knocked aside by each of them. While Namor soon defeated Trufaut, what happened to Dragonrider at this point is unknown. (New Thunderbolts#9 (fb) -BTS) - When religious factions in Atlantis became heated, one group decided to break away from Atlantis and form their own colony. (New Thunderbolts#1-3 (fb) - BTS) - Taking upon themselves the name of At'La'Tique, an ancient Atlantean phrase meaning the 'Fury of the Sea,' the religious rebels followed various leaders, including Nagala, Shakkoth, and Tamara Rahn. They formed a strike force called Fathom Five, which included Dragonrider, Llyron, Bloodtide, Sea Leopard, and Manowar. At'La'Tique's primary religious beliefs involved wiping out life on the surface world. To achieve this goal, they formed an alliance with Baron Von Strucker of HYDRA. (New Thunderbolts#2 (fb) - BTS) - Fathom Five led attacks against the Persian Gulf and China. (New Thunderbolts I#1) - Fathom Five led an attack on New York City, and were quickly opposed by the New Thunderbolts. Dragonrider rode one beast and commanded at least one more. Dragonrider withstood an attack from MACH-IV, then knocked Blizzard from the air. Blizzard froze the water around the beasts, restricting Dragonrider's movements. They soon retreated. (New Thunderbolts#2 - BTS) - Namor addressed the United Nations with promises of tracking down Fathom Five and punishing them. (New Thunderbolts#3) - Fathom Five opposed and defeated the small force Atlantis sent to deal with them. (New Thunderbolts#4) - Fathom Five attacked New York, and one of Dragonrider's beasts destroyed the Brooklyn Bridge. (New Thunderbolts#5) - Fathom Five did battle with Warbird and the New Thunderbolts. Dragonrider's beasts battled Atlas for a time, and she was horrified when Atlas began slaughtering her beasts with his fists. (New Thunderbolts#9 - BTS) - Most of Fathom Five, defeated, awaited their trial in a surface world prison. Comments: Created by J.M. DeMatteis, Bob Budiansky, and Danny Bulanadi. Dragonrider gained the ability to control certain undersea beasts, sometimes called dragons. 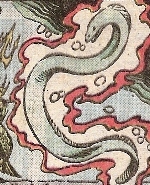 The first such beast she controlled was a mutated eel that had hypnotic powers (pictured left). 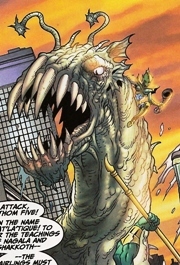 Dragonrider has controlled several similar-looking creatures.